Wow I thought, this is creative. The letter instructed me to call a number to “verify” the check, which was to cover the “3.6% government tax”. Well the tax rate was pretty dumb, but I digress. I did a quick search on the phone number and found that it was a cell phone in Toronto, Canada. That’s odd since the company logo on the check was in New Hampshire. 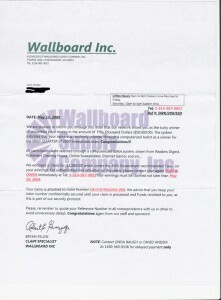 So I called up Wallboard Supply Company at the number on their website, and asked about it. Sure enough they were dealing with the scam on a large scale. 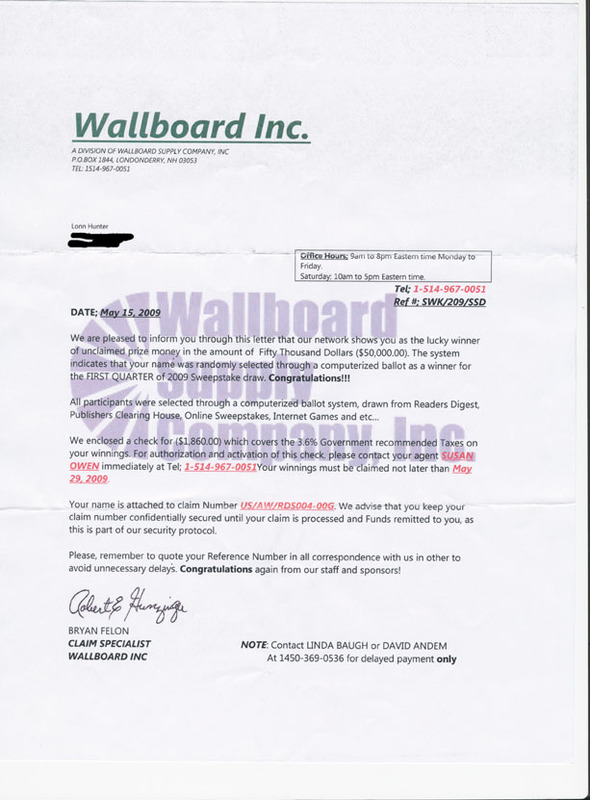 So, here is my conclusion about how the scam works. The check is real, and it goes to a real account. However, that account has a fraud alert on it, and the check will not clear. I never did call the number on the letter, but I suspect that they would have told me to cash the check and then paid “the government taxes” before they would release the remaining funds. I’m sure that they would be helpful in giving me the right account to send the “taxes”. After the victim sends in the money, the check bounces and the money is gone. So how did I do? If anyone else has seen this, let me know.